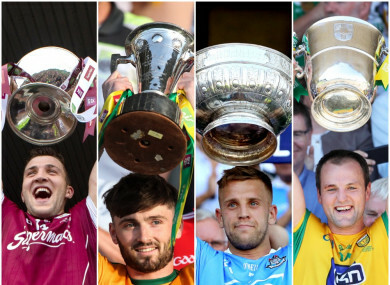 Galway, Kerry, Dublin and Donegal were crowned provincial champions this year. 53 DAYS AFTER Declan Hannon lifted the Liam MacCarthy Cup and 39 days after Stephen Cluxton hoisted the Sam Maguire, the focus will switch to 2019 championship matters tomorrow evening. The draws for next year’s GAA provincial championships will be broadcast live tomorrow night on RTÉ 2 with Michael Lyster presenting the coverage and analysis on offer from Anthony Daly, Ciaran Whelan, Henry Shefflin and Tomás Ó Sé. It may be difficult to drum up much excitement for a draw held so far in advance of the competitive action. In an era of round-robin hurling systems, football qualifiers and Super 8s, the value of the provinces seems to be continuously eroded. The new hurling systems that came into play in 2018 mean we already know the nature of next year’s championship with the days of knockout pairings behind us. The scheduling format in Leinster has been released, a few weeks after the planned order of games was revealed in Munster. Galway and Cork will be defending their provincial hurling titles next year, bidding for a three-in-a-row in each case. Galway will go up against Kilkenny, Dublin, Wexford and Carlow in Leinster while Cork’s Munster opponents will be Clare, Limerick, Tipperary and Waterford. So much of the spotlight tomorrow night will fall on Gaelic football matters. In Connacht, Galway will be aiming to retain their crown and will open with an assignment in London as it is their turn to travel to Ruislip. Mayo are already designated to head to New York for their opener with Roscommon, Leitrim and Sligo making up the rest of the teams in contention. In Leinster, Dublin’s rule continued this year and they’ll be gearing up for nine-in-a-row next season. They are already guaranteed a quarter-final spot along with the other semi-finalists from this summer – Carlow, Laois and Longford. That leaves Louth, Meath, Westmeath, Offaly, Kildare, Wicklow and Wexford all in the draw with six of them facing first round ties and one set to be pitted in a quarter-final against one of this year’s semi-finalists. In Munster, Cork and Kerry are seeded as semi-finalists after contesting this year’s decider with Clare, Limerick, Tipperary and Waterford to find out who they’ll play at the quarter-final stage. And finally in Ulster, it is open season with all nine sides – Antrim, Armagh, Cavan, Derry, Donegal, Down, Fermanagh, Monaghan and Tyrone – potentially facing the long route from the preliminary round. There will be change from 2020 with the teams in the preliminary round in 2019 exempt from featuring at that stage the year after. TV coverage begins tomorrow night at 8.30pm. Email “Set for 2019 - the draw for next year's GAA provincial championships take place tomorrow night”. Feedback on “Set for 2019 - the draw for next year's GAA provincial championships take place tomorrow night”.